Lexmark 17G0050 (No. 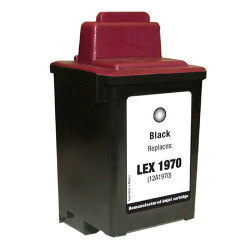 50) Compatible Black Inkjet Cartridge at unbelievable price saves you money without sacrificing quality. The compatible inkjet cartridge (also known as generic) are specially engineered to meet the highest standards of quality, reliability and exceptional yields that meet to exceed OEM (Original Equipment Manufacturer) standards and offer high-quality results. If you're looking for maximum performance, reliability and dramatic savings, this inkjet cartridge is the choice for you. 100% satisfaction guaranteed. The quality was never like the original, with line breaks clearly visible in text. Ink distribution across the page was quite patchy. Lexmark software directed clean cartridge tests did not yield any benefits. Thoroughly disappointed, will look at getting a replacement to check if I ended up with a defective piece. Completely satisfied. Order came when promised and cartridge works as well as the one the printer came with.